NAIROBI (Thomson Reuters Foundation) – Nations made their first global commitment towards curtailing the surging consumption of single-use plastics on Friday, but critics said it failed to confront the planet’s pollution crisis with the United States blocking efforts for more radical action. “We will address the damage to our ecosystems caused by the unsustainable use and disposal of plastic products, including by significantly reducing single-use plastic products by 2030,” said a ministerial declaration at the end of the summit. Countries would “work with the private sector to find affordable and environmentally friendly alternatives,” it added. The nearly 200 environment ministers also made a host of other commitments – ranging from reducing food waste and marine litter to developing and sharing innovative technologies and consulting indigenous people when developing policies. But environmental campaigners said the governments’ commitment on curbing plastic was disappointing and failed to urgently confront the ever-growing pollution crisis threatening the world’s waterways, ecosystems and health. Negotiators said most nations, including the European Union, at the UNEA backed stronger action suggested by India which wanted governments to commit to “phasing-out most problematic single-use plastic products by 2025”. But a few countries led by the United States – and including Saudi Arabia and Cuba – played “spoiler” by watering down the text, replacing it with a commitment to “significantly reduce” single-use plastics by 2030, said negotiators and campaigners. “The vast majority of countries came together to develop a vision for the future of global plastic governance,” said David Azoulay from the Center for International Environmental Law. “We support reducing the environmental impacts from the discharge of plastics, but we further note that the majority of marine plastic discharges comes from only six countries in Asia where improved waste management could radically decrease these discharges,” he said. Action is gearing up around the world – from countries banning plastic bags to companies vowing to cut their usage of plastic – yet still more efforts are needed to both reduce and recycle plastic, environmentalists said. Corporations have created a plastic monster. More than 90 percent of the plastics ever produced have not been recycled, yet corporations have plans to dramatically increase their production of plastic packaging. With plastic production set to quadruple by 2050, recycling can never be enough to solve this problem. But the global movement to hold these corporations accountable is growing. More than 3 million of you have joined us in urging companies to stop polluting our planet with throwaway plastic. And together with over 1,400 allies in the global Break Free From Plastic movement, we conducted 239 cleanups in 42 countries to identify the biggest corporate polluters. In October, Greenpeace International released the Crisis of Convenience report, based on a survey to 11 of the biggest fast-moving consumer goods companies globally. Despite some of these companies publicly signing a voluntary, non-binding commitment to tackle the crisis, the report revealed that none of the companies surveyed currently have comprehensive plans to move away from single-use packaging; on the contrary, most of them have plans to increase the overall amount of plastic packaging they produce. So now we are deploying the Greenpeace ships; the Rainbow Warrior and the Beluga, to tell the global story of where plastic pollution really starts and ends. We are rallying supporters worldwide to help hold these companies accountable and to make sure they follow up on their words with bold action. Because we don’t need more talk—we need concrete, urgent action to stop plastic pollution at the source! 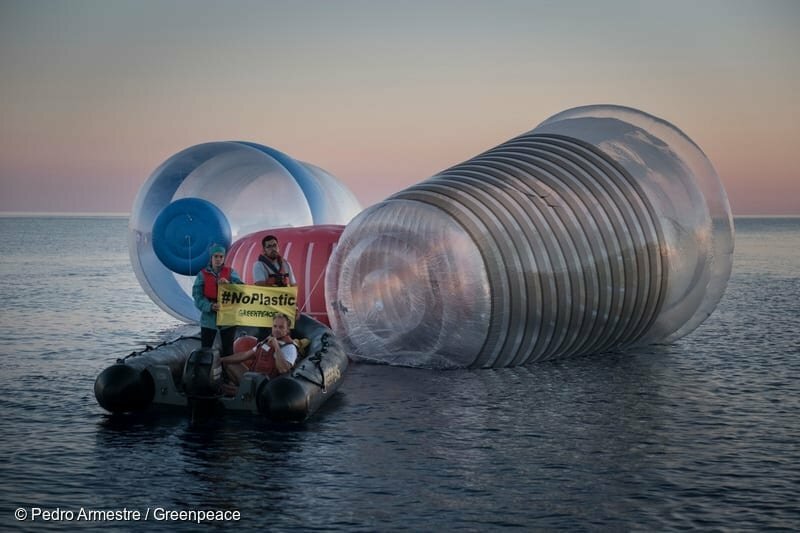 Greenpeace’s flagship, the Rainbow Warrior, has been surrounded by giant single-use plastic items in Mediterranean waters. The action seeks to make visible the invisible, and to denounce the problem of plastic pollution in the oceans, especially in the Mediterranean Sea. It’s time for Nestlé, Unilever, Coca-Cola, PepsiCo., Colgate, Danone, Johnson & Johnson and Mars to be transparent about exactly how much plastic packaging they are producing, and make concrete plans to reduce. It’s time for these corporations to invest in alternative ways to deliver their products to us and phase out single-use plastic. These companies have created a monster, and we are not willing to allow the plastic monster to grow anymore. We need concrete plans for reduction, and we need them now. We need corporations to slay the plastic monster. Stay tuned for more details about Greenpeace’s ships’ whereabouts in the coming weeks and months and to see how you can get involved! Graham Forbes is Greenpeace’s global seafood markets project leader. Originally posted in EcoWatch. This press release was originally issued by the Rethink Plastic alliance. The European policy alliance of the #breakfreefromplastic movement. Brussels, 30 January 2019 – The EU will use its powerful chemical laws to stop most microplastics and microbeads being added to cosmetics, paints, detergents, some farm, medical and other products, according to a draft law due to be tabled today. The European Chemicals Agency says that 10,000 to 60,000 tonnes of microplastics intentionally added to products leak into the environment yearly, are impossible to remove and last for thousands of years. The scale of the problem is dramatic: six times the size of the Great Pacific Garbage Patch, or the plastic pollution generated by 10 billion plastic bottles, the agency says. Microplastics accumulate and persist in the environment, one of the main reasons why the agency concluded it is necessary to restrict microplastic ingredients under REACH, the strictest set of chemical laws in the world. The restriction is expected to become law across Europe by 2020. It will prevent an estimated 400,000 tonnes of plastic pollution, the agency says. NGOs welcomed the move as a significant step forward, but strongly warn that it grants unnecessary delays for most industrial sectors and excludes some biodegradable polymers. As it stands, the draft law will only restrict one sector when it comes into force, namely cleansing products made by firms that have already pledged to stop using microplastic. Other sectors will be granted 2-6 years before the law takes effect. The proposal will go to public consultation this summer followed by economic, social and risk assessments, then a vote by government experts in the secretive REACH committee not before early 2020. The ban is part of the EU plastics strategy that saw Europe become the first continent to start banning many types of single use plastic by 2021. Read the proposal and the annex. Dumaguete, Philippines – Silliman University (SU), a private university in the central part of the Philippines, is implementing a new policy that eliminates single-use plastic bags and aims towards Zero Waste, the first university in the country to do so. SU’s new environmental policy was approved unanimously by its Board of Trustees (BOT) on November 17. The university’s commitment to the prevention of environmental pollution, conservation and enhancement of natural resources, and sustainability is defined in the Environmental Principles, Policies, Guidelines and Best Practices that the SU BOT has adopted in full. By being a model and incorporating environmental issues into its teaching, research, and community service, Silliman hopes that students entering the university will leave with a deeper commitment to sustainability and with the competence to protect the environment wherever their lives may take them. One immediate focus of Silliman University starting this semester is to improve on-campus waste management, announced SU president Betty Cernol-McCann during the All-University Academic Convocation on November 19. “The practice of proper waste management in the University shall be effective immediately,” said Dr. McCann. “Henceforth, all trash cans will be properly labeled and faculty, staff, and students will be asked to segregate waste accordingly. Waste Management Committee members and volunteers will visit each building to label bins and provide instructions on segregation.” All biodegradable wastes from the campus, she said, will be composted with the assistance of the College of Agriculture. Meanwhile, reuse and recycling of all recyclable materials will be maximized. Another immediate focus of the University is to minimize plastic waste. “We will intensify our drive against one-use plastics and prohibit bringing to campus containers and wrappers that contribute heavily to waste pollution,” Dr. McCann added. In support of the international Break Free From Plastics movement, she said, a consistent media campaign and Information, Education and Communication strategy will be employed to disseminate information on the policies and guidelines associated with this objective. Imagine being on a sailing ship, only seeing the ocean’s vastness, working with the elements, no other distractions whatsoever. Crossing the Atlantic Ocean in 2014 Dutch sailor Thomas van Thiel was already ten days out on the open sea when he suddenly saw a plastic bottle floating around. He was shocked, seeing something man-made that far from civilization. He started to see plastic everywhere and decided to take action. By the ocean we unite was born – a foundation that contributes to research worldwide, creates awareness and educates and activates people, organisations and governments to make much needed changes. It only takes one decision to start a whole movement. The Mediterranean is one of the most polluted seas of the world. If on this tiny piece of the earth along the coast we easily fill up a bag with garbage that big that we literally have to push it through the door of our campervan, we can only feel confronted with our own behaviour; this is how we are treating the earth. It is not them, it is all of us, it is everywhere. 80% of all the waste in our oceans comes from land. Start cleaning your environment whenever you can! It is not THE solution. Letting the plastics go through your own hands does make you feel part of the problem, it makes you feel responsible. You’ll start to think of solutions, preventing more plastic from ending up in the ocean by reducing it at source. In 2016 it all came together: my love for the ocean, my desire to experience filmmaking and the need I felt to communicate a message about humans and the ocean. Thomas from By The Ocean We Unite asked me to join him and tell the world about the ocean. One subject stayed with us, it was tangible, we could not neglect it: plastic. This planet is a blue planet, seen from space. What happens when the biggest part of our planet is filled up with plastic in the form of bigger plastics, micro plastics and nano plastics? Our journey had started, we gathered a team for our first sailing expedition ‘Up to Norway’. By now, so many awesome people have joined us on our mission, Ziggy Alberts being one of them. His song ‘The Ocean Song’ immediately came to my mind when I started to make ‘By the Ocean we Unite – an awareness journey into plastic pollution’. Throwing away is something we do naturally, it is part of the cycle of life. The problem is that ‘away’ is not ‘away’ when we talk about plastic. It can easily take more than a lifetime for it to disappear. By that time it will have killed animals and polluted our environment. Even many biodegradable products will only degrade under certain circumstances and not in the open environment, let alone in the ocean, where most of the waste from land ends up anyway. On the contrary, throwing away a piece of apple or carrot will contribute to a nice compost for our plants and trees, building a healthy soil. These days I am enjoying throwing away organic material and compost it. . Start throwing away more things that benefit the earth! Grow your own food, start to plant trees and buy more plastic free products. The #breakfreefromplastic global movement invites Starbucks CEO Kevin Thompson to see where Starbucks trash ends up: much of it across South East Asia. In an effort to quell growing concerns about Starbucks wasteful packaging, the company just announced to much fanfare that it would phase out plastic straws and replace them with “recyclable” plastic lids. In fact, the same type of plastic Starbucks claims is “recyclable” is being sent to landfills across the nation, or shipped to countries like Malaysia or Vietnam– where it becomes pollution. “Starbucks’ claims about the ability of #5 plastics to be ‘widely recycled’ are bankrupt,” says Stiv Wilson, Director of Campaigns at the Story of Stuff Project. “This incredible attention to a single product isn’t necessarily a bad thing, but it isn’t quite a good thing either if it doesn’t lead to broader, systemic change in how the world makes, uses, and disposes of the most ubiquitous material in commerce today—plastic,” he added. As companies like Starbucks are increasingly under fire for their contribution to the plastic pollution crisis, they have primarily relied on recycling as the solution to their wasteful packaging, despite its many flaws. As a result, the US has been sending even larger quantities of “recyclable” plastic to China, causing the tremendous environmental damage that led the country to close its doors. Now the US has started sending its plastic waste to other countries in Asia, sparking these countries to enact similar bans and restrictions. In many of the countries Starbuck has stores, there is little to no recycling infrastructure. Not only do Starbucks’ branded straws, hot cups, cold cups, and lids show up in beach cleanups, according to the global trash app, Litterati, Starbucks branded products are easily in the top three of brands identified globally if not number one. With that in mind, the #breakfreefromplastic movement invites Starbucks CEO Kevin Johnson to visit the communities in Southeast Asia most impacted by the plastic waste created by companies headquartered in the global north.